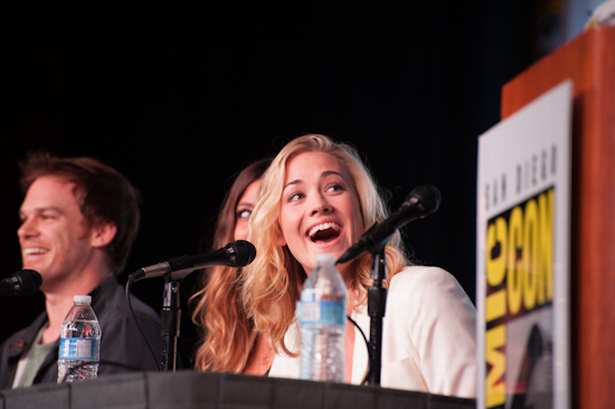 See below three more Comic-Con 2012 videos from the Dexter panel uploaded by Showtime: "Hannah": Yvonne Strahovski discusses her character in season 7 of Dexter. "What Will Deb Do? ": Jennifer Carpenter discusses whether or not Debra knows that Dexter is a serial killer. "Dexter Morgan is For the People": Michael C. Hall discusses the reactions he gets from people for playing a serial killer. -"if there are any creepy people out there, then please write Michael." Its great to see Yvonne there! will be interesting to see how she's used and how much. Imo they totally wasted the chance to have mch vs olmos on screen, it would have been titanic. I am so looking forward to this season its freaking unreal! ! !